One of the things that you’ll learn about when you go on a Prague Extravaganza Free Tour is the revolt of the Bohemian noblemen against the Hapsburg monarchy in the early part of the 17th century, an incident which was the catalyst that kicked off the 30 Years War in Europe. The revolt was unsuccessful, and after their defeat at the Battle of the White Mountain in November of 1620, the 27 ringleaders of the insurrection were all executed on Prague’s Old Town Square. 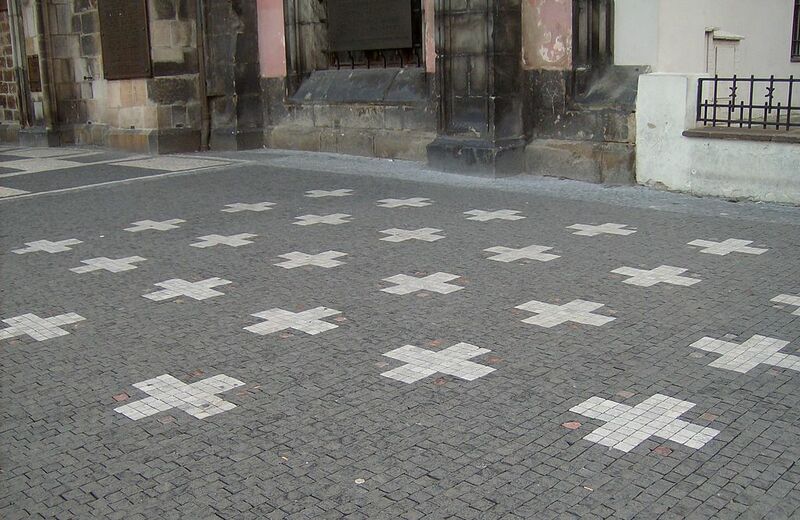 The site of their deaths is today marked with 27 white crosses which are built into the paving stones in front of the old Old Town Hall just around the corner from the astronomical clock (not to be confused with the new Old Town Hall several blocks away which is the actual seat of Prague city government today). Your Prague Extravaganza guide will tell you all about this revolt in fascinating detail. This article, however, will not focus on the 27 executed men and the cause they rallied around, but rather on the man who dealt them their deaths after their defeat – Jan Mydlar, Master Executioner of Prague. Several years ago when I was working as a script writer and tour guide for one of Prague’s ghost tour companies, I came across this very interesting historical character who, since the end of his life in 1664, has become immortalized in Czech legend and literature. He has been used as the subject of plays, novels, and even musicals. Probably the most well-known saga of his life (or at least the one most readily available to English speakers) is an historical novel by journalist and historian Josef Svátek which was published in 1905. Though the book is filled with numerous conjectures and dramatic conventions which are not necessarily strict historic fact, Svátek was an historical scholar who engaged in vigorous research about his subjects, and all the available information about his Jan Mydlar novel suggests that he went through public archives and centuries-old documents with a fine-tooth comb as preparation for writing the book, and that we can generally assume that his portrayal of the Master Executioner is accurate. In fact, in the prologue to the novel, Svátek is quoted as having said that he actually discovered the hand-written journal of Executioner Mydlar among a stack of ancient Prague court documents. (Though for all my Google skills, I was unable to find this journal myself, if indeed it still exists.) So I used Svátek’s novel The Executioner of Prague as a starting point, and then did my best to cross-reference his fictional work against other sources. The following is a summary of what I’ve learned, hopefully with most of the unverifiable information noted as such. We have all felt extreme fear before, but for most of us it must be hard to imagine the feeling of walking up the gallows stairs to meet Death. And even more difficult it must be to imagine what it must have felt like to have been the Executioner. What was it like, the life of the man under the hood? What were his experiences? What did he feel? Besides hanging and beheading criminals and political prisoners, a typical Executioner in times of old was also responsible for extracting his victims’ confessions during trial by using torture and brutal forms of physical coercion. In addition to these duties, the profession could also involve cleaning up the corpses of suicides, disposing of dead animals from the streets, the killing of stray dogs, and other tasks that were considered unwholesome and unfit to be performed by more ‘honorable’ Christian citizens. In some towns, where perhaps superstitious people suspected that there was a vampire inhabiting their local graveyard, the Executioner could be responsible for digging up the grave of a suspected vampire, chopping the body into pieces, and then maybe burning it to ashes in order to ensure that the dead remained dead. On the other hand, being an Executioner must have been a bit like being a rock star. You were a bad boy in leather pants on a stage in front of thousands of people. And when you chopped off the head of a convicted murderer, the crowd roared with applause. The Executioner of Prague’s Old Town was also, like a rock star, well-paid for the work that he did and he had a financially comfortable lifestyle. Though his job was distasteful to most people, the work he did was considered a necessary evil of the times he lived in because the Executioner was the final enactor of the harsh sentences handed down by the courts’ brutal system of justice. To the people of old Europe, the Executioner’s blade was the only thing that stood between civilized society and the anarchy of lawlessness. However, the Executioner was also a social outcast. He and his family were unclean. He was only allowed to frequent one specific pub, and there he had to sit at a table apart from other customers. He was only allowed to attend one specific church and there he and his family had to sit in a special box which was hidden from the view of the other worshipers. The Executioner of Prague was only allowed to enter the city through one designated gate which was near one of the town garbage dumps. If the Executioner so much as touched another person, that person was dishonored, so becuase of this the Executioner wasn’t even allowed to shake hands in normal company. The only sort of social life he and his family could expect to enjoy was visiting with other executioners and their families from other town districts and villages. So at the start of his career, Jan Mydlář was considered by his fellow Praguers to be a pariah not fit for the company of his fellow men. Of course that didn’t prevent the good citizens from sneaking to the Executioner’s house in the middle of the night to buy short pieces of used hangman’s rope which they believed brought them good luck. Nor did it prevent the poor peasants who couldn’t afford proper medical treatment from seeking out his assistance in healing wounds and setting broken limbs, skills which an Executioner normally learned during his years working in the torture chamber, though he wasn’t normally allowed to sell his medical skills until he had completed 100 successful kills. The Executioner’s profession was usually hereditary. The son of an executioner would also become an executioner because no other profession was open to him. And the sons and daughters of executioners could only marry the sons and daughters of other executioners. Normally, no one chose this life for themselves. It was something one was born into and saddled with for the rest of their days. 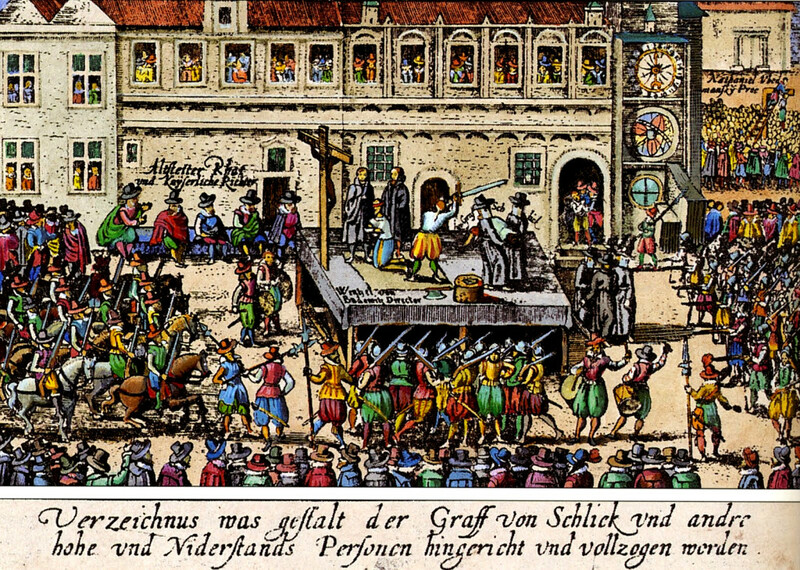 But there were a few rare exceptions to this rule, one of whom it is believed was Jan Mydlar who was the Old Town’s main executioner during much of the reign of Emperor Rudolf II and during the early part of the 17th century. Master Mydlar was born into the well-to-do family of a minor burgher in the town of Chrudim and given a good education as part of his upbringing. As a child he attended an expensive Latin academy and, after graduating from that, he went to Prague to study medicine at Saint Wencelaus College which later was incorporated into Charles University. For whatever reason, he didn’t become a doctor as he failed to pass his final exams. According to Josef Svátek’s novel, before he had left Chrudim, the young man had fallen in love with a distant cousin of his named Dorota. Supposedly, while Mydlar was away in Prague, his beloved had begun hanging around with some corrupt young noblemen, one of whom managed to impregnate her. She was then quickly married off to an elderly Chrudim merchant in order to avoid bringing shame on her family. However, both her aged husband and her newly-born child were soon found dead, and Dorota was arrested and convicted of poisoning them along with three suspected witches who were accused of selling her the poison. When Mydlar heard about this, he allegedly left school in Prague and headed home, not believing that any of the horrible things said about his girlfriend could possibly be true. Once in Chrudim, Svátek’s novel supposes, the grief-stricken young man quickly apprenticed himself to the local Chrudim executioner as part of a clever plan to gain access to the prison where Dorota was being held in order to help her escape before she was executed by being buried alive. Unfortunately for Jan, his plan failed, the escape was foiled, and Dorota was lost forever. 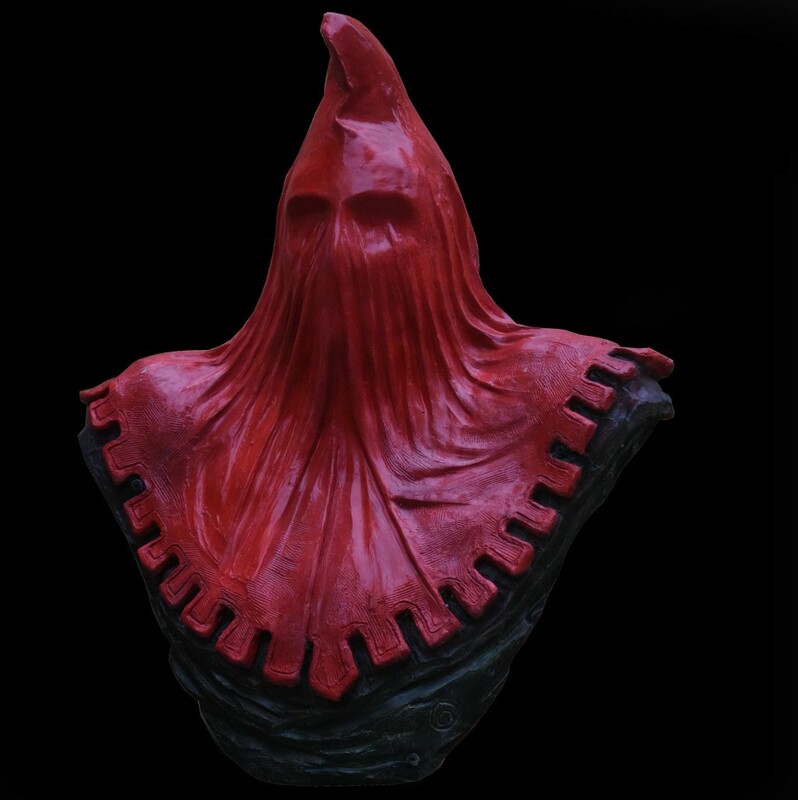 Weeping bitter tears of Shakespearean grief, young Mydlář gave up his medical aspirations and devoted himself entirely to his newly acquired profession of Executioner because he had nothing else left to live for. To me, one of the most interesting things about Master Mydlar is the attitude that he adopted towards his occupation. I’ve already mentioned the low-life status that was conferred upon the executioner’s caste by society at large. But Mydlar would have none of it. As far as he was concerned, he was an honest man doing honest work for an honest wage, and ugly as it was, it was still a job that was necessary for the preservation of the social order and the restraint of the criminal element in society, not to mention a just dessert for traitors and other evil people of all kinds. Mydlář refused to act like or accept the role of a pariah. He dressed well, he behaved like a gentleman, he held his head high in public, and among other charitable actions, he donated large amounts of money to research for the advancement of medical science, medicine having remained a lifelong passion of his even though he hadn’t become a doctor as he had originally planned. Because of this, he was eventually almost accepted by his fellow citizens as a stand-up member of his community. He still might not have been able to shake another man’s hand in the street, but he managed to gain the respect of his peers during his lifetime, something which was unheard of in Bohemia or in Europe generally at that time. Tragically, all of this respectability that he’d worked so hard to achieve during his lifetime was lost after the Bohemian revolt and the executions of 1621. Though, as a fellow Protestant, he was probably sympathetic to the causes of the uprising against the Catholic empire carried out by the Protestant Bohemian noblemen, after their defeat at the Battle of the White Mountain, he willingly carried out the execution of the 27 ringleaders because, as a loyal servant of the Crown, it was his sworn duty to do so in spite of whatever his personal beliefs may have been. After that, he was considered by many to be a traitor to the cause of Bohemian liberation, and he was once again shunned by all. His wife Běta was, in the long run, unable to deal with the family’s fall from their hard-won social acceptance and their return to absolute pariah status, and she eventually committed suicide. And though Mydlar eventually remarried and had many children (it’s unclear how many, but there were several who went on to become well-known executioner themselves), he was never able to regain the respectable status he’d come to enjoy during the first half of his life. He lived well and he lived comfortably, even eventually buying a fine house near the modern site of IP Pavlova in the New Town, but he lived always as a notorious outsider. The white crosses which mark the spot of the execution of the 27 Bohemian noblemen on the Old Town Square in Prague.